Rise of the Black Panther #2 Review – AiPT! T’Challa learns the hardships of being king. T’Challa is now king of Wakanda and is responsible for its defenses. But defending the kingdom may not always mean doing the best thing for himself. And just who is this Namor guy? Evan Narcisse and Javier Pina tackle T’Challa’s early days as king in Rise of the Black Panther #2. As with the previous issue, Narcisse pays close attention to T’Challa’s history and mines some untapped strings to create this new story. A lot of this is from necessity: when Hudlin was creating opening arc of Black Panther, he was told it would be out-of-continuity before it was ultimately folded into the Marvel canon. As such, Hudlin’s supporting cast and tales of T’Challa’s early days didn’t quite match what was previously set in stone by Priest. Narcisse expertly weaves these stories into a coherent whole, giving longtime Black Panther fans character interactions (such as Hunter and S’Yan) that they could previously only dream about. Unlike the debut, however, Rise of the Black Panther #2 is less interested in the history lesson, so much as it is in showing a young T’Challa learning the hardships of being a king. The plot here focuses on a search for missing Wakandans. The search leads T’Challa to Niganda and to Namor the Sub-Mariner who has been attacked himself. Narcisse really captures the voice of both of these monarchs, especially in their younger (and more hot-headed) days. The interaction between them also creates a nice thread between Rise of the Black Panther and Jonathan Hickman’s New Avengers run. At times, Narcisse’s writing can get a bit verbose. There are big ideas about the responsibilities of ruling that Narcisse rightly delves into, but due to the issue focusing on the T’Challa/Namor interaction, these more talkative moments can seem particularly long. That being said, Narcisse’s dialogue still flows well, so while the pacing of the issue is a little off, the quality of the dialogue itself doesn’t dip. The artwork by Javier Pina is dramatic with a great balance between detailed emotive figures and heightened action. Pina’s designs are a lot of fun, including an early version of the skybike that T’Challa utilizes in Reginald Hudlin’s run. Pina and colorist Stephane Paitreau also pull off a nice feat with the use of shading. At one point, T’Challa stiffens his gloves with the kinetic energy his suit has absorbed and removes them, stiffened, in the side of Namor’s ship. Thanks to Pina’s lineart and the variation in Paitreau’s coloring, the gloves actually look like empty gloves that are standing on their own rather than gloves with disembodied hands. A change in pace from the previous issue, Rise of the Black Panther #2 nevertheless provides a further look into T’Challa’s history. Evan Narcisse captures the voices of the characters well, and creates a fun action story that sets up their relationship well. The artwork by Javier Pina and Stephane Paitreau makes for a fantastic read. A little wordy in places, Rise of the Black Panther #2 is nevertheless a great story that builds on its lead character's history in an exciting fashion. Evan Narcisse expertly weaves together some of the more disparate ends of T'Challa's early history. 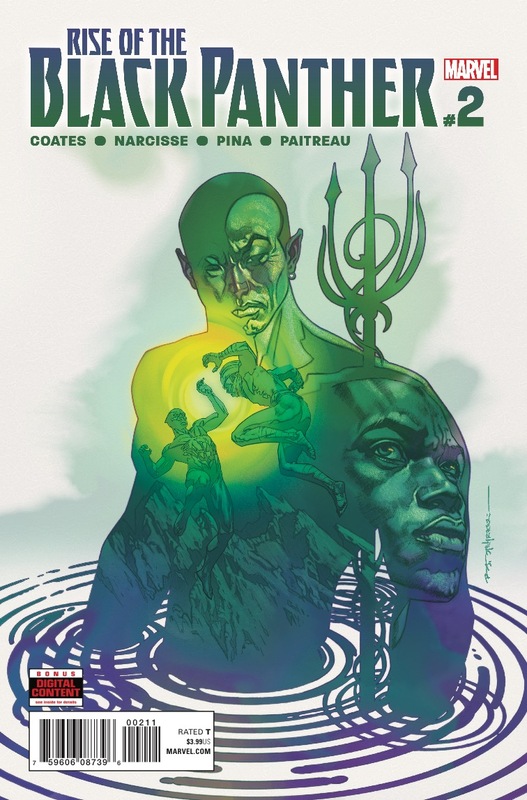 Narcisse captures the voices of T'Challa and Namor extremely well. The pacing of the issue is thrown off by the lengthy dialogue in places. This doesn't flow quite as evenly as the first issue.